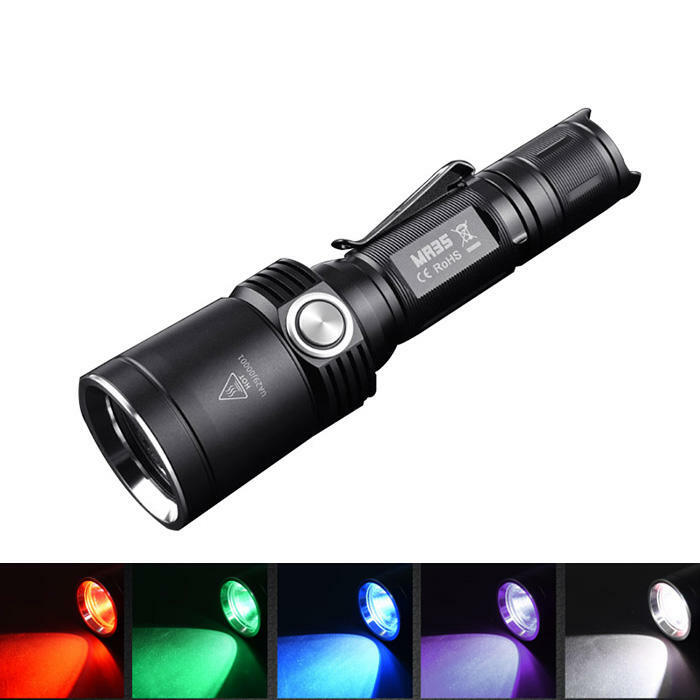 MR35 is a White+ RGB(high Power chip)+UV 5 separate LED chips combined, compact tactical flashlight with a stunning 1200 lumens maximum white output and emits high bright RGB light , It's ideal for map reading, hunting, riding, camping and outdoor activities. - On/Off: Hold and click the tail cap power on, again power off (torch has mode memory function). - Mode change: when power on, press the side switch In short, High-Medium-Low mode will be changed In cycle, press In constant then release, Red, Green, Blue and UV mode will be changed In cycle as well, furthermore since UV is Invisible for human being, when UV LED chip is power on, the lamp embeds in the side switch will brinks In green or red(when power is giving out ),quick tap the side switch twice, Strobe mode will be triggered in white, blue &red and red in turn, tap the side switch back to white normal illumination mode. - Power recharging: lift the black rubber cap and connect the USB cable Included to the Micro USB port then Insert another end to the USB outlet as below guide(2#).when torch is recharging In USB cable, CAN NOT work in order to prevent battery from damage. - White+RGB+UV LED high power chips combined. - Metal reflector to create a high intensity beam. - Removable pocket clip; USB cable, nylon holster and Lanyard included.